Posted by admin in activity reports, eruptions, Russia, Sarychev Peak. The SVERT update on Sarychev Peak for 13 July 2009 reports low-level activity with gas emission but no ash explosions: ‘According to satellite images from today, (MODIS 0907130031UTC), (NOAA 17 0907122247 UTC) ash-gas emission is observed at Sarychev volcano. It stretches east 40 km’. 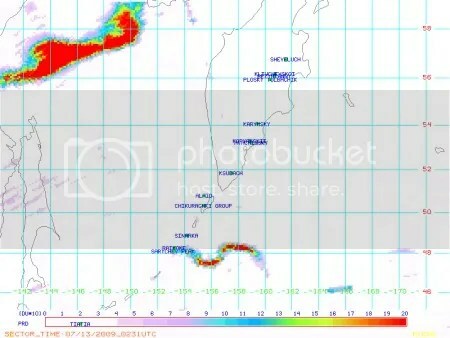 The gas cloud visible in the north-west of the Sea of Okhotsk is the residue of that emitted by Sarychev Peak earlier this month (e.g., see the update on 9 July 2009). For all our Sarychev Peak coverage: Sarychev Peak « The Volcanism Blog. Posted by admin in activity reports, Africa, eruptions, Ethiopia. 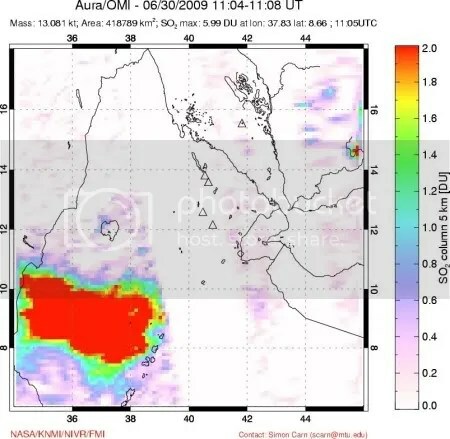 Thermal anomalies and dense sulphur dioxide plumes in Ethiopia appear to indicate that a significant effusive eruption has taken place in the Manda Hararo area of the western Afar region. There is as yet no visual confirmation of the eruption from the ground. 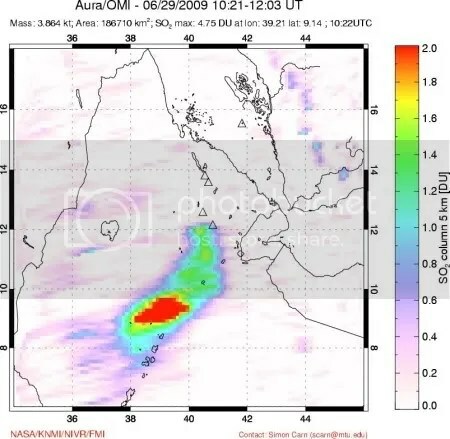 There was a VEI=2 eruption at the Manda Hararo volcanic complex in August 2007, and a larger (possibly VEI=3) eruption in the Alu-Dalaffilla region in November 2008. In terms of size, volcanic SO2 expert Prof Simon Carn of Michigan Technical University reports that the current Manda Hararo event seems to lie somewhere between the two. UPDATE: Dr Erik Klemetti has an informative post about this event at Eruptions. He has also wisely used maps showing up-to-date political boundaries, thus saving himself a heap of trouble. For other Ethiopian volcanism coverage: Ethiopia « The Volcanism Blog.